Finding a movie that would entertain your young child but avoid scaring him or otherwise leave him scarred for life is a rather challenging affair, but we put ourselves to it from time to time. 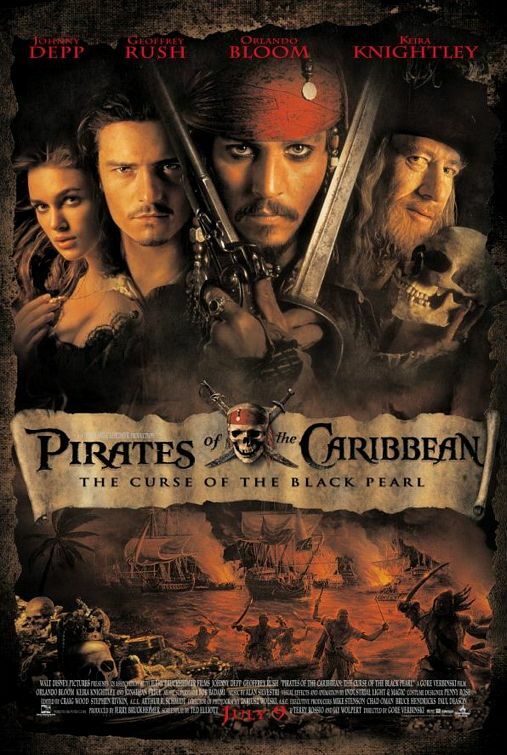 This time around, browsing through Netflix’ catalog, we stumbled upon this blast from the past: 2003’s Pirates of the Caribbean: The Curse of the Black Pearl, as in – the original Pirates of the Caribbean! Sure, the sequels (here and here for the first two) were a travesty, but the original was OK, wasn’t it? Well, it turned out to be more than OK. It was fun! Sure, the kid didn’t like it that much – it’s probably still too much for him to take – and the plot is far too complicated for anyone to follow or make sense of. Still, there’s nothing wrong with spending one’s time in the company of some excellent actors having fun through almost two and a half hours of adventure, is there? Just in case you lived the past decade on another planet, I will try and provide you with an overview of the rather convoluted plot. Taking place at and around British colonies in the Caribbean, during the high time of piracy, we follow a governor’s daughter (Keira Knightley). She’s intended to marry a promising navy officer she does not love (Jack Davenport, whom I will always remember for Coupling greatness); if anything, she has her heart going for a metal worker she helped rescue from the sea back when they were both children (Orlando Bloom). Circumstances change when a ship-less pirate hits town to seek himself a ship, Jack Sparrow (Johnny Depp in what will probably be remembered as his most memorable performance). Sparrow’s aim is to re-acquire his former ship, the Black Pearl; problem is, that ship is now run by a crew of ghost pirates under the command of evil Barbossa (Geoffrey Rush). Sparrow’s quest reshuffles the various lovers decks of cards and provides ample opportunities for entertaining, slapstick and revolutionary [for the time] computer special effects. Do not look for depth or anything with this one. However, if you’re up for some easy fun, Black Pearl delivers aplenty. Overall: Easy entertainment hardly ever comes better than this (as proven by the sequels). 3.5 out of 5 crabs.